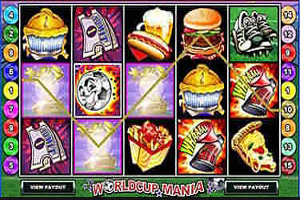 World Cup Mania is a five reeled video slot machine that has a total of fifteen paylines. The game is powered by Microgaming, this is why players can expect a fun game that comes packed with great visuals and a great set of rewarding features including a free spins round, a wild icon and a scatter symbol as well as a jackpot payout. Play WorldCup Mania Slot here. The game is themed around the world of soccer, this is why if you are a soccer fan, then you will surely fall for this game. The symbols that land on the 15 lines of the game include a soccer ball, a soccer golden trophy, bacon and fries, pizza, hotdog and beer, soccer shoes and more. The flaming smiling football is the wild symbol of the game that can replace any of the other standard symbols on the reels of the game in order to increase the players’ winning chances by helping them in creating a winning combo on any of the activated bet lines of the game. The Blowing whistle is another special icon, 3 of these symbols appearing on the reels are going to trigger the free spins round in which players will earn 10 spins. Lastly, the golden trophy bonus symbol is the last special icon of the game that can trigger the Free Kick Bonus round when 3, 4 or 5 of them land on the lines.